Need to buy some new cosmetics? 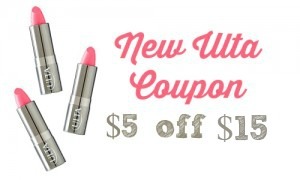 Ulta is offering a coupon code that will get you $5 off your Ulta brand products order of $15 or more! Use code 309554 at checkout. You can use this code with their Buy 2, Get 2 FREE sale on Ulta products to get some great deals on eye liner, foundation, lipstick, and more. Makes it $11 ($2.75 each)! Makes it $15 ($3.75 each)! Coupon code is valid through 4/18.